Anuradha Desai joined the leadership team of EdVestors in August 2013 as Senior Vice President for External Relations. A seasoned nonprofit executive, prior to joining EdVestors, Anuradha most recently worked at the anti-poverty fund, Boston Rising, as the Senior Partner for External Affairs. Previously, she served as the first Executive Director of International Center for Conciliation for three years, helping to scale its international programs and to build its capacity to work with divided communities around the world through conciliation. Anuradha’s past nonprofit experiences include her work with TIFA, a human rights foundation in Indonesia; eight years as the Executive Director of Organizational Development at Citizen Schools, a national program with a focus on after-school education; three years as the Director of Special Projects at the Feinstein International Center at Tufts University; and 10 years at Oxfam America in various leadership roles. 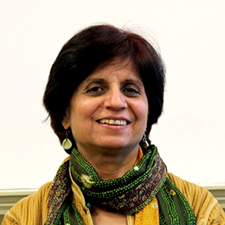 Over the years Anuradha has served on the board of regional and international organizations, including Oxfam America, Grassroots International and Massachusetts Service Alliance. Anuradha received her Master’s Degree in Public Administration from Harvard University’s Kennedy School of Government, and was awarded the prestigious Presidential Scholarship. She also has a Master’s Degree in Urban Studies and Architecture from the Royal Academy of Denmark, where she was awarded the DANIDA fellowship. Anuradha lives in the city of Boston.